Hugely popular chef Nick Difu recently added to his mini restaurant empire with Nick’s Next Door — big, bustling and with super food. 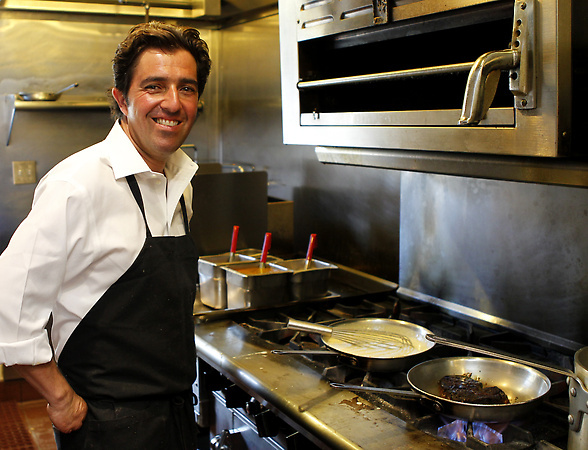 Chef Nick Difu is the pied piper of Los Gatos; diners follow him anywhere. 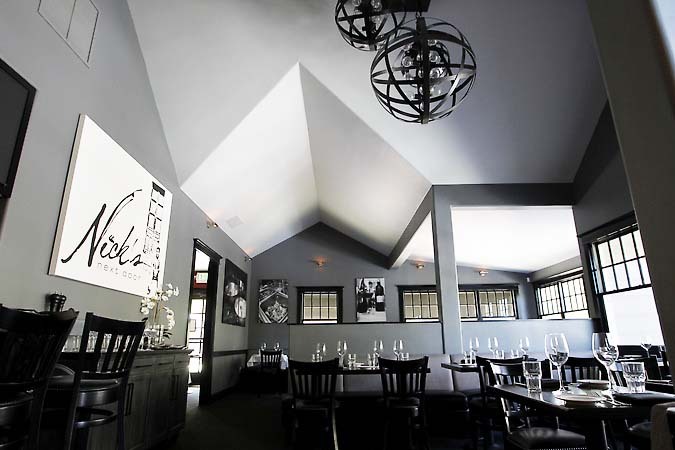 Most recently, they’re thronging to Nick’s Next Door, opened in May to supposedly handle the overflow from diminutive Nick’s on Main, his popular, four-year-old restaurant. The trouble is, Nick’s Next Door (it’s actually across the street and up a tad) has been so swamped with eaters lusting after his extroverted style of belt-loosening, beguiling cooking that Nick may need to keep opening new outposts. Nobody deserves this success more than Nick, a local boy who spent years doing his flavorful thing at a string of Los Gatos dining spots before finally becoming his own boss in 2008. The gregarious Sicilian-American not only knows how to turn out upscale comfort food, he makes sure his guests get cheerful service and have a good time, attending to their needs personally. Gregarious Nick Difu — nicknamed Chef-3-lefty because he has just three fingers, all on his left hand — doesn’t let this impact his cooking skills or his attitude. Nick has wisely transported some of the biggest hits from Nick’s on Main to his new spot, making a few tweaks along the way. The fall-off-the-bone Mongolian baby-back ribs, sinfully juicy duck confit and Nani’s meatloaf are among several familiar items beloved by regulars. Nick is one of the few chefs serving pheasant breast and this moist, flavorful bird and its rosemary demiglace make an appearance at his new place, too. Besides the ribs, duck confit and a salmon version of his tuna tartare tower — layered with avocado and tomato — Nick’s starters also include the enticing composed salads he’s known for and rich, honey-and cognac-laced chicken paté, reminiscent of the duck iteration from his older spot. But perhaps the most decadent starter is a newbie: risotto croquettes with parmesan, pancetta confit and pesto dipping sauce. A riff on Sicilian arancini, these deep-fried rice balls are a crispy-outside, gooey-inside delight. 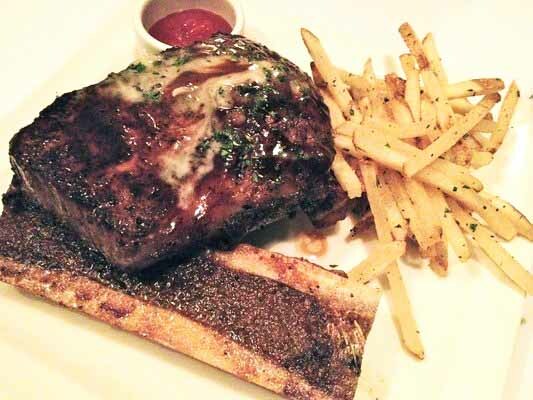 Patrons swoon over Nick’s over-the-top rib eye with marrow bone and skinny fries. Like everything served at Nick’s Next Door, entrees are copious and impossible to stop eating. The runaway favorite in these early days is Nick’s rib eye with marrow and perfect skinny fries. A beast of a steak already, Nick takes it blissfully over the top with the roasted marrow bone, whose super-fatty contents are blended with mirepoix. Pan roasting is one of Nick’s favorite cooking methods and he nails it repeatedly with items like the rib eye, pheasant breast, a glorious new pork tenderloin dish served with duck-fat farro (a toothy, irresistible grain that’s addictive with the flavorful fat) and a new lamb creation. Called lamb-chop lollipops, they’re basically little loins trimmed to a splendid, meaty essence on the long bone, topped with mint-infused port wine figs. 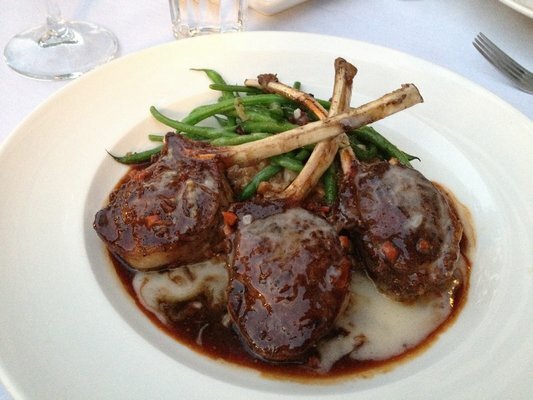 Lamb-chop lollipops are another example of Nick’s people-pleasing approach to cooking, in which calorie counts are best ignored. Nick does very well with fish, too. He sears scallops and serves them with more of that habit-forming duck-fat farro. The Chilean seabass is magnificent, the snowy flesh riding above a mélange of sweet cherry tomatoes, little padron peppers and braised pork belly. 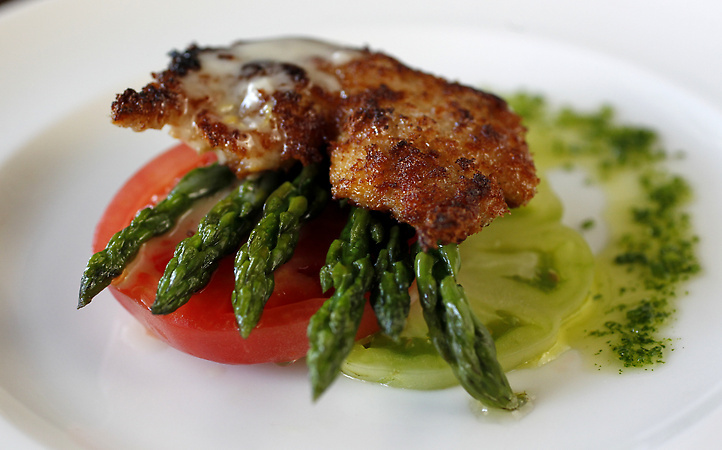 Hard-to-find abalone — a wonderful seasonal treat — is handled just right, breaded, lightly fried and paired with heirloom tomatoes, asparagus spears and butter sauce. Abalone is a treat that many chefs overlook. Not Nick, who treats it right with pan-frying, yummy accompaniments and a just-right sauce. There isn’t a printed dessert menu but usually available are unpretentious options like lemon olive-oil cake, fruit cobbler, panna cotta and banana bread pudding, a popular item from the sister restaurant. 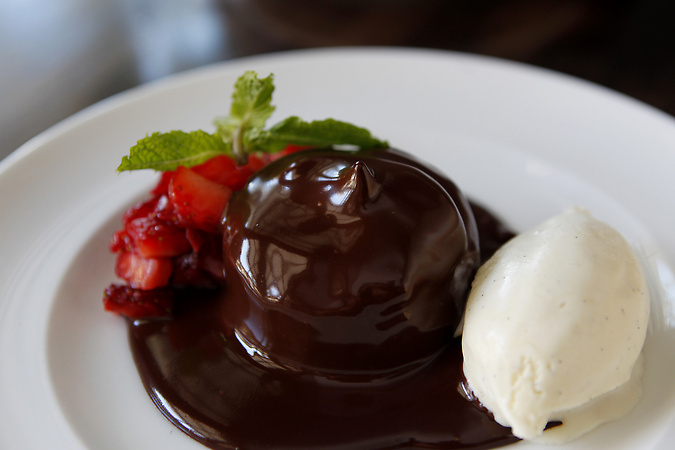 But the essential Nick’s dessert — meaning decadent — is chocolate-peanut-butter mousse, an opulent mound that’s like a Reese’s cup turned into a three-star dessert, served with ice cream and strawberries. Pleasure is the currency of the day at Nick’s Next Door. Nick’s motto seems to be, “don’t hold back” when it comes to crafting people-pleasing, hedonistic cuisine that isn’t just comforting but exciting on a visual level as well. The big, gorgeous, colorful plates that fly out of the kitchen here beg to be devoured. Not surprisingly, the lounge — a new element in the growing Nick’s empire — takes pleasing people seriously, too. Signature cocktails are available and are fun to try at the zinc and leather bar. Given how many walk-in diners are getting turned away at this instantly mobbed new spot, at least there’s a nice place to drown one’s sorrows. 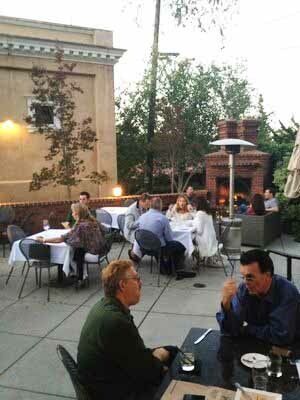 The brick patio — along with the bar — are new additions to Nick’s growing Los Gatos restaurant portfolio. HOURS: Dinner only, 5-10 p.m., Tuesday-Saturday. Reservations strongly recommended. PRICES: Salads & starters: $6-16; entrees: $21-45; desserts: $7. This entry was posted in Restaurant Reviews and tagged baby back ribs, duck confit, los gatos, Nick Difu, Nick's on Main. Bookmark the permalink.